The Canadian euthanasia/assisted suicide (euphemistically known as Medical Aid in Dying (MAiD) data has been missing. I have received multiple inquiries asking how many Canadians have died by MAiD, now we have some data, but not from the government. On March 15, 2019; Jocelyn Downie, Canada’s leading “academic” pro-euthanasia activist spoke at a lunch lecture for the Royal Society of Canada in Ottawa. In her presentation Downie stated that 7949 people have reportedly died by MAiD in Canada as of December 31, 2018. Downie clearly has access to euthanasia data that is otherwise unavailable. Since the Third Interim report on MAiD indicated that there were 3714 reported assisted deaths up until December 31, 2017, Downie’s data indicates that there were 4235 assisted deaths in 2018, up from 2704 reported assisted deaths in 2017. Based on Downie’s data, in 2018, the number of reported assisted deaths increased by more than 50% and assisted deaths represented more than 1.5% of all deaths. Last December Québec published euthanasia data indicating that 1664 people died by MAiD from December 2015 to March 31, 2018. The data also indicated that there were 171 missing reports and 142 assisted deaths that were unaccounted. 2 cases – The person was not at the end of life. 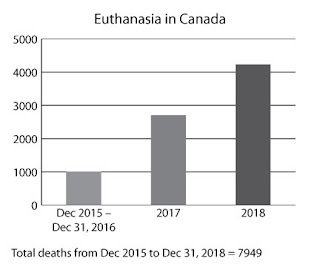 For more information read: Third report from Québec’s euthanasia commission – 142 unaccounted deaths. According to the Downie data there were 4235 reported assisted deaths in 2018, 2704 assisted deaths in 2017 and 1010 reported assisted deaths (Dec 2015 – Dec 31, 2016). Similar to the Netherlands and Belgium, nearly all of the assisted deaths are euthanasia (done by lethal injection) rather than assisted suicide.